Palm trees are a beautiful and unique staple of the scenery in any warm, tropical climate. Two edible fruits - coconuts and dates - grow on some varieties of Palm trees, but people are sometimes confused as to which Palm trees grow each of these delicious fruits. 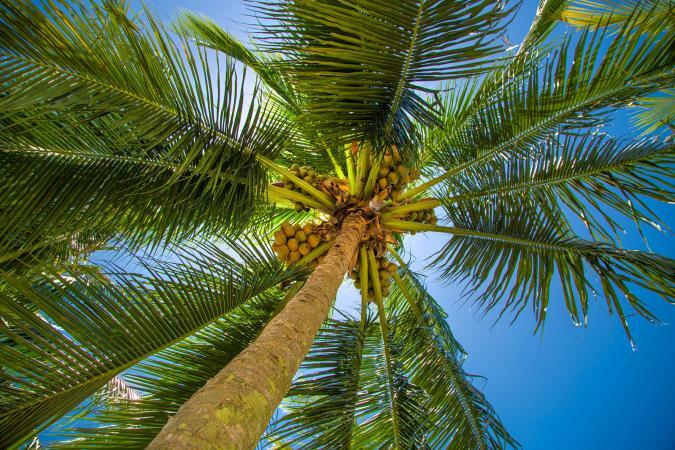 The Coconut Palm tree is grown throughout the tropical regions, and thrives in sandy soils, abundant sunlight, warm temperatures and high humidity. It is one of the most famous types of Palm trees due to the popularity and widespread use of the coconut fruit. 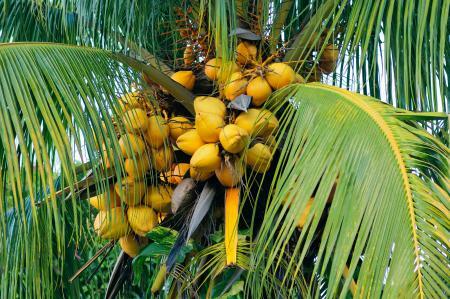 Technically, the coconut is what is called a drupe, a fruit with a fleshy layer - it is not a true nut. 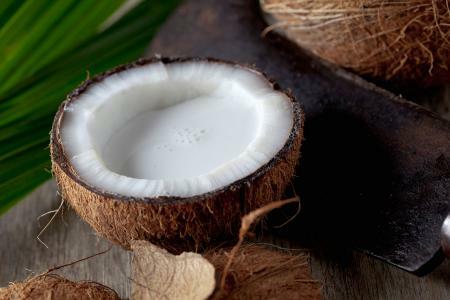 The "meat" of the coconut, which is the white flesh inside, provides oil, which is used for cooking and making margarine. The meat of the coconut can also be cooked, eaten raw, or dried. The meat of the coconut can be pressed for its juice, referred to as coconut milk, which is a healthy drink and can also be used in cooking. 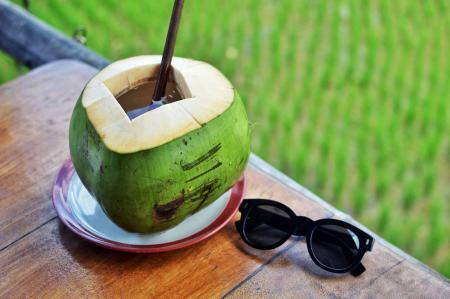 The cavity of the coconut is filled with "coconut water," which contains a large amount of sugar, vitamins, minerals, and fiber, and is an excellent, nutritious drink. The hard coconut shell is often used to make things, from bowls to buttons. 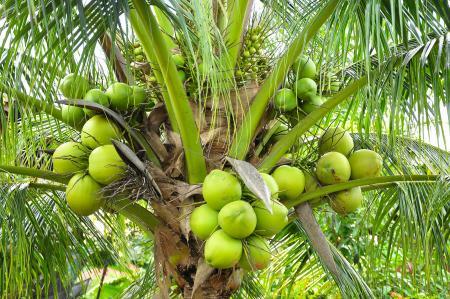 The flowers of a coconut bloom produce a sap, which can be used as a drink. It can also be fermented to produce "Palm wine." The buds of the coconut blooms are also edible and are known as heart-of-palm. They are a delicacy and often used in high-end culinary recipes. Dates are a sweet, fiber-filled fruit grown on certain types of Palm trees, known as Date Palms. 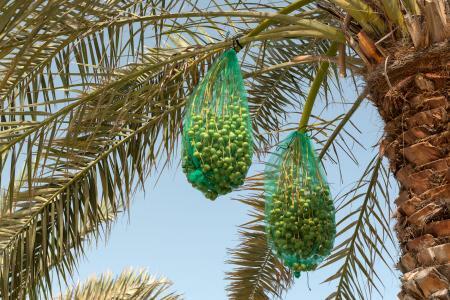 Date Palms are specially cultivated for the fruit and probably originated around the Persian Gulf, although today they are grown anywhere the climate is suitable due to their desirability. Dates have been a food staple in the Middle East for centuries and are often mentioned in the Bible. Dates may be eaten, fresh or dried; they may also be pitted and stuffed with various fillings such as cream cheese. Multiple puddings and desserts, particularly those of Middle Eastern origin, contain chopped dates, sometimes glazed with glucose syrups. Dates are popular in the U.S. as a holiday food, often baked into breads along with nuts, cinnamon, and other traditional ingredients. Their sweet flavor is nicely balanced by the richness of the spices. Date juice is used in some Islamic areas as a form of non-alcoholic champagne. The seeds of the date can be ground up and used as cheap animal food. Date oil is often used in soap and cosmetics and requires little chemical processing, making it cheap and natural. Date seeds may be burned in place of charcoal or even used as an additive to coffee beans to enrich the flavor of coffee and stretch the beans to make more volume. The high tannin content of dates allows for their use in many traditional medicines; they have a natural cleansing and astringent power and can be used for everything from sore throats to colds and fever. 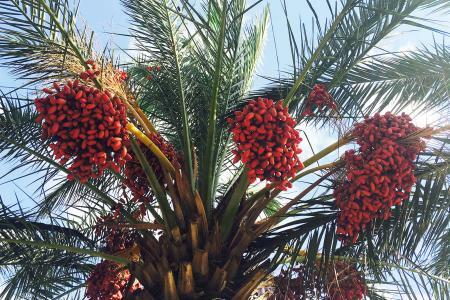 The sap of the Date Palm tree may be used to make a special syrup that adds sweetness to foods and recipes. The leaves of the Date Palm tree are perhaps best-known for their use during Palm Sunday in Christian tradition. They are also used in North Africa for making sheltering huts; their large size, waterproof nature, and durability make them suitable for everything from basket-weaving to fans. The wood of Date Palm trees is very light and can be used for crafts as well as making things such as decorative structures (posts, railings, etc.) to actual infrastructures such as bridges. The wood is easy to carry and cut and withstands weather well, although it's not the most durable of woods. Extra wood may also be burned for fuel. 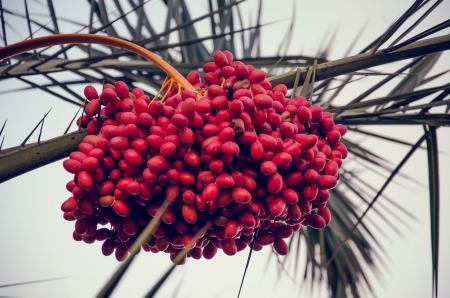 Other types of Palm fruits grown on other types of Palm trees are, in fact, edible, and some have multiple uses, but no two are as popular or as widespread as coconuts and dates. No other palm fruits their way so successfully into the daily culture or seen such wide-spread methods of use.